Here’s a true story: I like embellishing things that typically aren’t embellished. Notebooks, jackets, coffee mugs… you name it. Making “jewelry” for autumn boots is one of them. 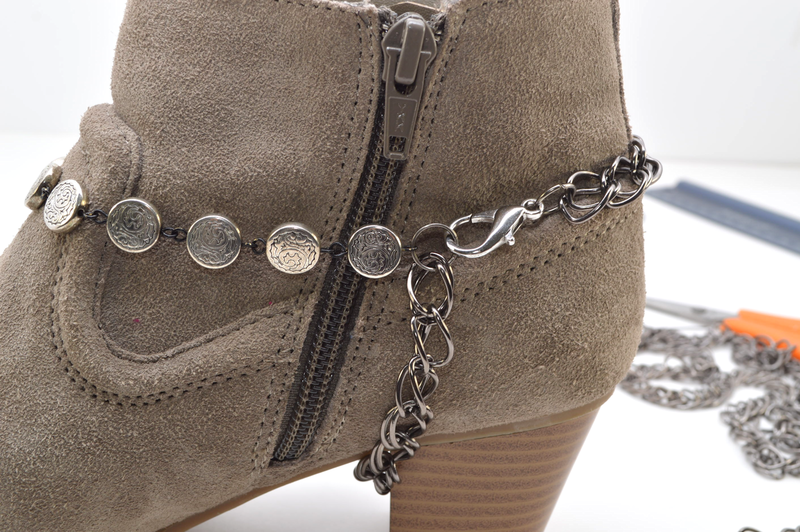 These chain boot harnesses require basic jewelry-making skills, and can be easily removed or replaced. See how I made them, below! * I used a total of 26 beads (each measuring .5 inch/1.27 centimeters wide). The finished strand of beads, connected with eye pins, was 8 inches/20.32 centimeters. This may be longer or shorter depending on preference, type of beads and style of boots. 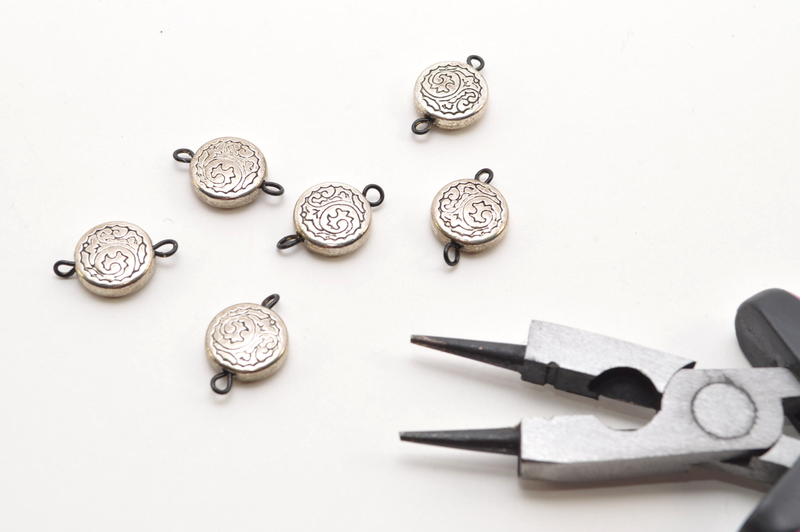 1) Add one bead to an eye pin. 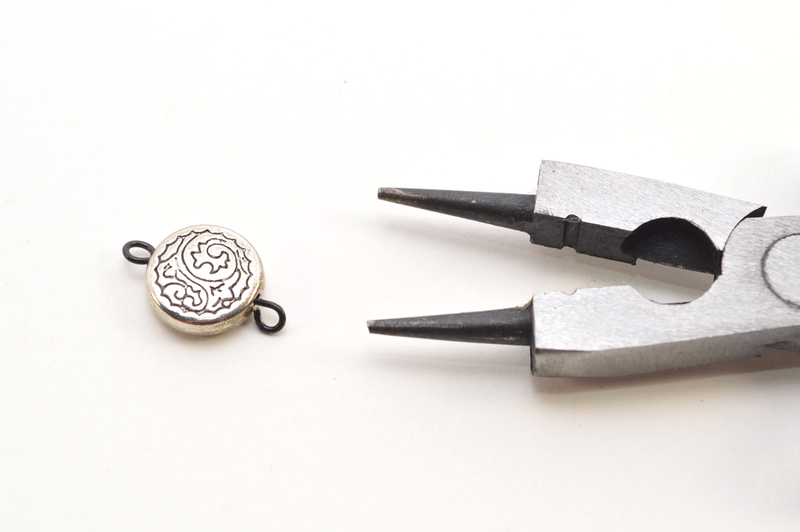 2) Using the cutting portion of the pliers, trim the eye pin about 1/4 inch (0.63 centimeters) from the bead. 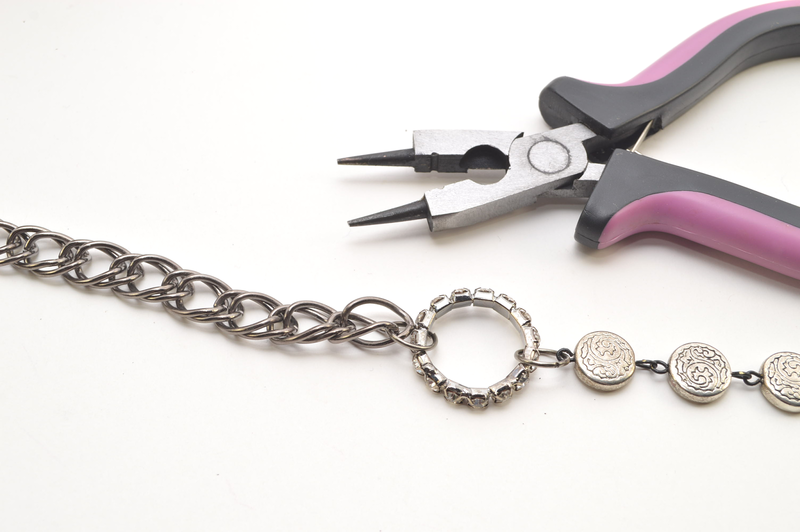 3) Using the round nosed portion of the pliers, create a loop. 5) … until you reach the desired length of the beaded strand. I used 13 beads for 8 inches worth, eye pins included. 6) Check the strand against the front of a boot. 8 inches was perfect for mine; adjust yours accordingly. 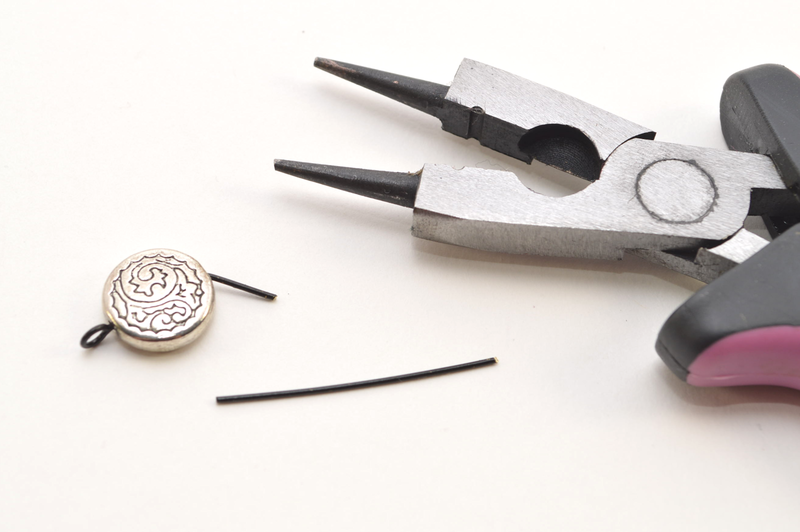 7) Using the pliers and a large jump ring, connect the beaded strand to the metal circle connector. 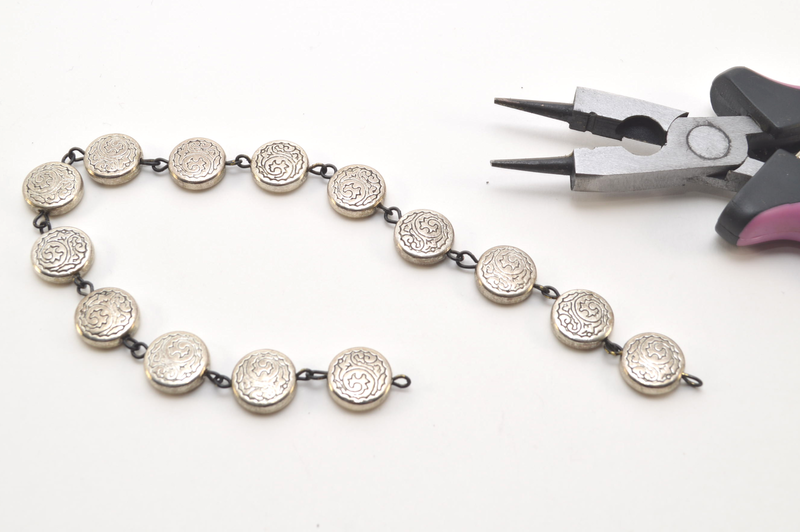 8) Use another jump ring to attach the connector to chain. 9) Wrap the beaded strand-connector-chain trio around the boot, with the connector facing the outside. Trim the chain so that the beaded strand and chain can be connected. Leave a little extra room for 2 jump ring and a jewelry clasp; this will take a bit of trial and error to make sure everything fits around the boot. 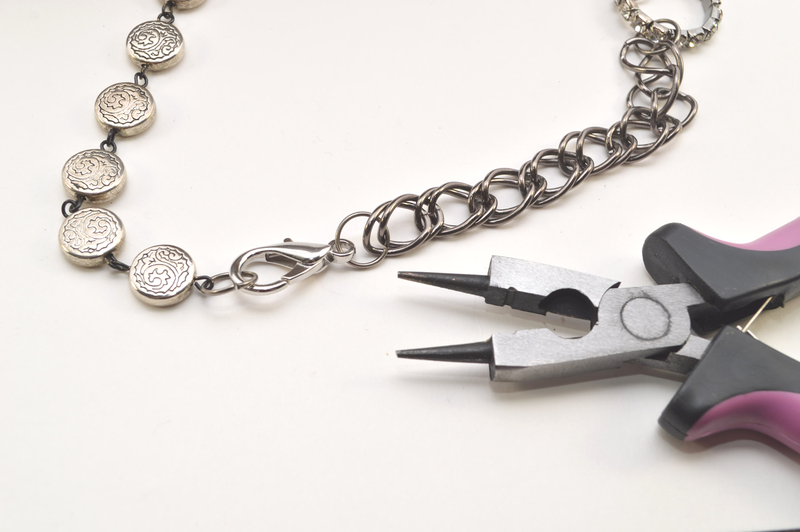 10) Attach a jewelry clasp to the chain with a jump ring. Attach another jump ring to the beaded strap for the clasp to hold on to. The beaded strand & chain portion: check! The clasp should be positioned along the inside of the boot. 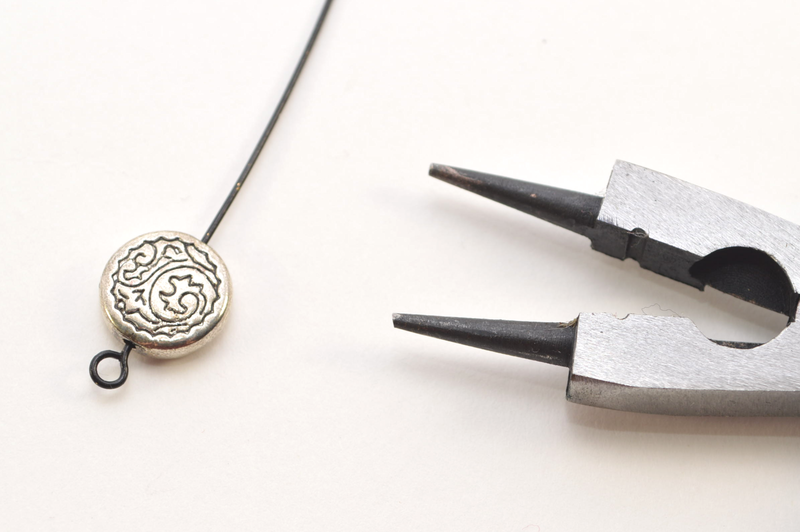 11) Attach a long strand of chain to the connector with a jump ring. 13) …and up around to the other side, where the clasp is. 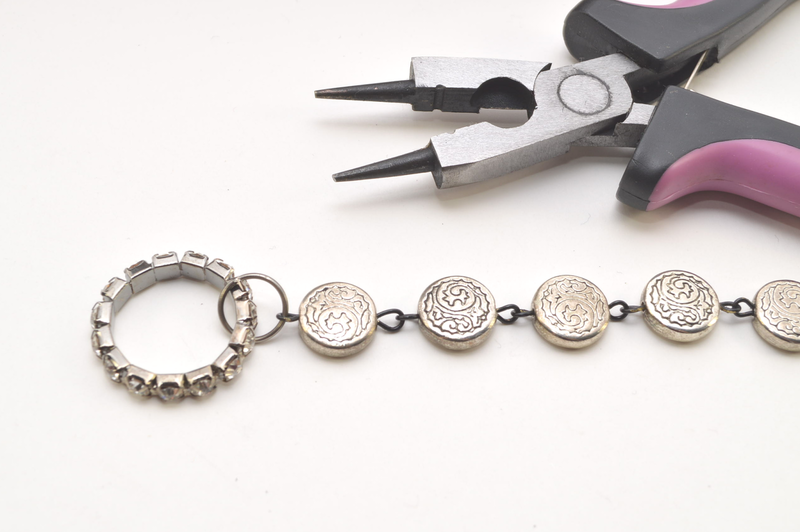 14) Trim the chain so that it can be attached the jump ring that the clasp is holding onto. Again, you’ll have to play with it a bit to ensure that everything fits snugly and not too loose. Otherwise, it will slip right off. 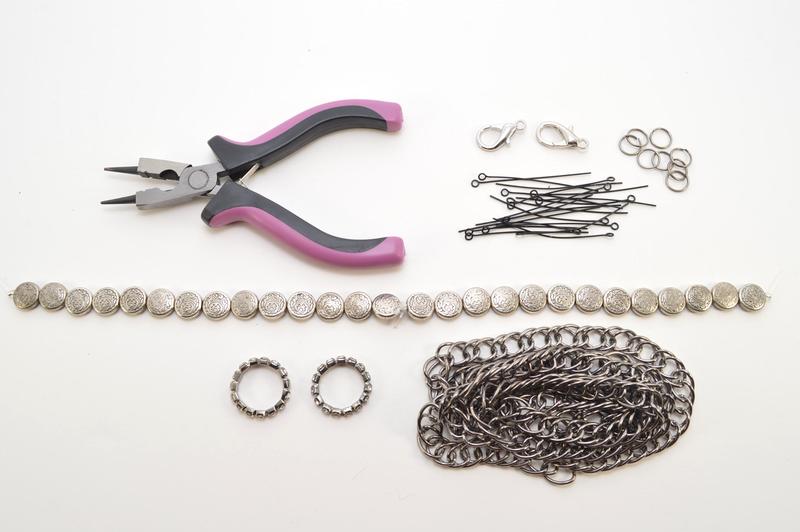 It’s a good idea to start with too much chain and then trim slowly from there. As I always say: you can always take some away, but it’s harder to add it back! To make another one, simply repeat the entire tutorial. If you’re feeling particularly edgy, you can always just rock one harness on one boot. 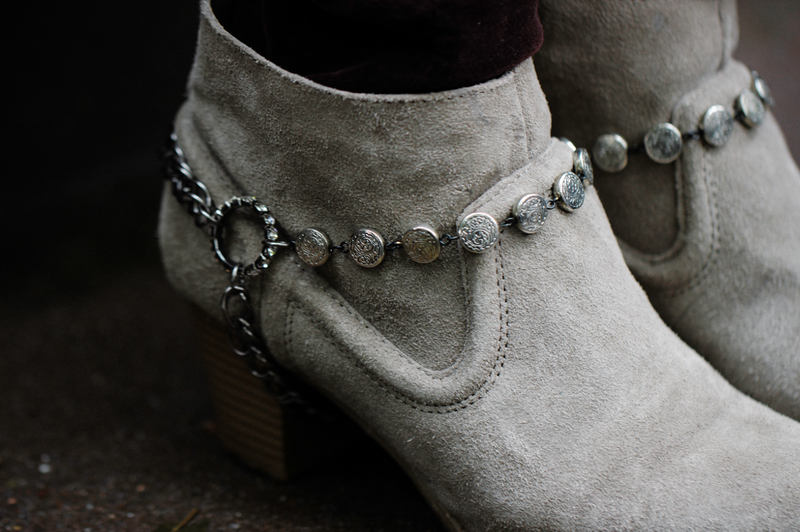 I love the way the silver and gunmetal plays off of the tan suede material of the boots. These chain harnesses can be customized to your taste and preference. They can also be easily removed whenever you say so. In seconds, I can get bring the plain tan boots by simply removing the harnesses. It’s a great way to add some longevity and options to your fall shoes.